The days of having to turn a key to start your car seem to be over because why use a key when you can use your smartphone, and during CES 2012 Viper introduced their Viper SmartStart 3.0 for Android and iOS and should become available sometime in the first quarter on the Android Market and iTunes. 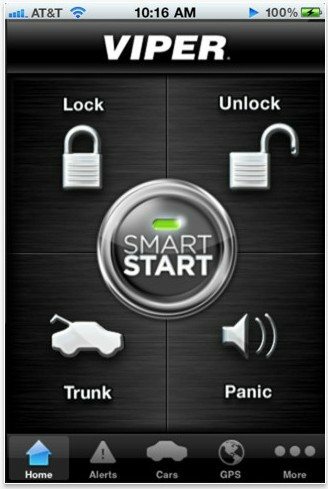 The leader in keyless lifestyle, the Viper SmartStart has been downloaded in excess of 1 million iPhone, Android and BlackBerry devices, and enables the user to unlock, start, monitor and lock their vehicle via their chosen smartphone. Viper SmartStart 3.0 offers new features to drivers and introduces the promise of the Cloud-connected car delivering a real time two-way link between smartphone and vehicle. A signature feature with Viper SmartStart 3.0 is a feature known as SmartSchedule that tells SmartStart the users daily routine whilst Directed Cloud Services continually monitor location, temperature, and schedule variables in the Cloud and push Smart Alerts to their handset letting them know when it is time to arm up the vehicle. Viper SmartStart 3.0 also has the ability to receive Vehicle Diagnostics, which will be available soon on selected vehicle installations and thus enable the user to access info about the health of their vehicle. Other features supported by Viper SmartStart 3.0 are enhanced System Status and Auxiliary Channels and will soon have all multi-zone control and customisation options found on other direct two-way remotes.